Do you have visual fatigue syndrome? Visual fatigue describes a group of eye and vision-related problems that result from prolonged computer, tablet, e-reader and cell phone use. Many individuals experience eye discomfort and vision problems when viewing digital screens for extended periods. You may not even know that you do! 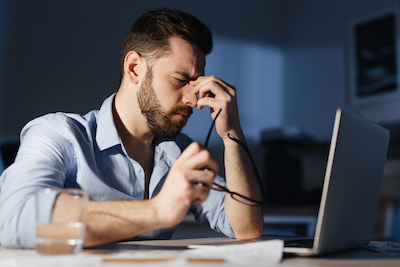 If you find yourself leaning in to see the computer taking your glasses on and off for better vision or neck strain from finding the sweet spot in your glasses you are suffering from eye strain. You may even have dryness or burning and headaches that are caused by looking at the computer for extended periods. If your eyes are more tired at the end of the day than the beginning you may have visual fatigue syndrome. We, at Bridgeport Family Vision Clinic have solutions for you. Computer glasses and blue light blocking lenses are options that can reduce or even alleviate this debilitating condition. Computer glasses are intended to be prescribed as a second pair to compliment the patient’s primary pair of glasses. The prescription can be calculated to the exact distance you sit from your screen, to give you the sharpest vision possible. If you need a bifocal to see papers on your desk this can be accommodated as well. Blue light is the part of the visible light spectrum, which comes from both the sun and artificial light sources like digital screens and fluorescent lights. This type of light gets absorbed deep in the eye, making it potentially impacting to long-term vision. Between computers, tablets, and smartphones, we’re looking at screens more than ever before. All that screen time can be hard on your eyes and may cause digital eye strain. Olympia Vision Clinic would like to help solve your digital eye strain!